Batley's Keegan Hirst is halted by Catalans defenders Remi Casty, Jason Baitieri and Dave Taylor last Friday. Batley Bulldogs face a crunch clash at home to top four rivals Halifax on Sunday as the race for the Super Eights begins to intensify. Batley go into the game lying sixth in the Kingstone Press Championship but just a point behind a trio of sides immediately above them. The Bulldogs have recruited to strengthen their injury ravaged squad and will look to end a four-match losing run and boost their confidence going into a crucial period of games. 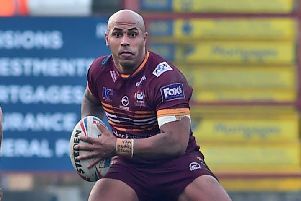 Batley have had an extra couple of days to recuperate following last Friday’s gallant effort in the Challenge Cup defeat to Super League high fliers Catalans Dragons. Bulldogs captain Keegan Hirst paid tribute to the team following the 40-4 defeat. Speaking after the game, Hirst said: “All the boys dug in and we can be proud of ourselves and hopefully we can take that grit and determination into the league with us. “We always knew it was going to be a tough game against a full-time side. “It is always hard to turn up and play against a side like (Catalans) when you have been working all day but we stuck in there. Coach John Kear added: “I’m proud of the effort and commitment of my players as that was a pretty special Catalans team. “They are tough and physical but they are smart as well and changed how the played as the game went on and rolled us down the hill. Halifax put up a terrific display against Super League opposition in the cup before going down 28-18 at home to Widnes Vikings last Sunday. Fax arrive at Batley having won five of their last six Championship matches, although Batley won 17-12 at The Shay in February.